The new and improved Dual Drive Elite Point Driver represents the next generation of easy-to-use, efficient picture framing point-driving tools. The Dual Drive Elite fires stacks of either rigid or flexible inserts into all types of wood frame moldings, and features a tension adjustment for harder woods. Affordable enough for artists, yet tough enough for framers, with an improved comfort grip handle and easy-pull action, the Dual Drive Elite is the "must-have" tool for any picture framer. For successful operation, use only authentic Logan points (F53, F54, F55 or F56). The Dual Driver Elite comes with 50 rigid point and 50 flexible points. The F500-2 Dual Drive Elite measures 8" W × 6½" H × 2" D (20 cm × 17 cm × 5 cm). 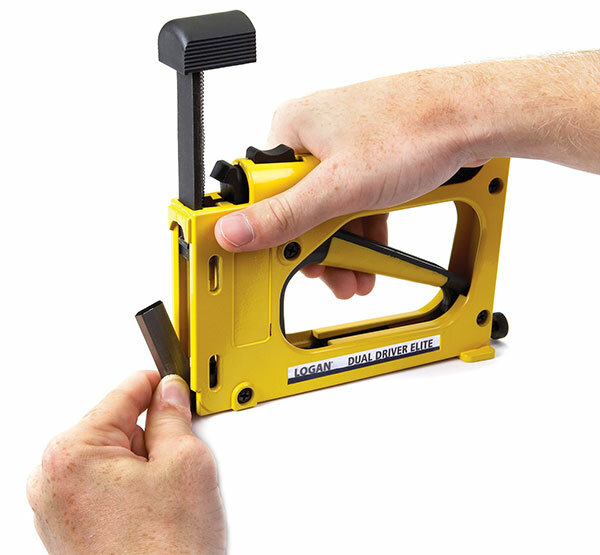 Rigid Points — Rigid points provide a more permanent solution to assembling a frame. These are more often used with long-term permanent artwork. If a backing paper is used to finish a frame a rigid point is more commonly used when assembling the frame. In order to remove the artwork from the frame the rigid point needs to be removed from the frame itself, which requires the use of tools. Flexible Points — These points allow the user to bend them after a frame has been assembled, so that the artwork can be removed without removing the point from the wood. Flexible points can be bent by hand and then bent back into place when the frame is reassembled.